The EHF is holding its tenth referee candidate course from Saturday 14 until Saturday 21 July 2012 at the first European Universities Games in Cordoba, Spain. Eight referee couples from Austria, Belgium, Spain, Finland, France, Italy, Portugal and Russia are taking part in the course. In the men’s handball competition, teams from Belarus, Croatia, France, Georgia, Lithuania, Netherlands, Norway, Portugal (two teams), Spain (two teams) and Turkey are competing. Germany, Lithuania, Poland, Portugal, Spain (two teams) and Turkey (two teams) are taking part in the women’s competition. The course is organised by EHF Competence Academy & Network (EHF CAN), the European Handball Federation's education service, which offers coaches, officials, athletes and administrators from all over Europe (and the world) access to the highest quality education relating to handball know-how and competence. In order to guarantee high level of refereeing all over the Europe, various programmes have been organised, targeting referee- and delegate education with a special focus on young referees and female referees. During the course, the referees will have to undergo physical test and theoretical knowledge tests. Furthermore their ability to manage a match on a high level will be tested and discussed with the presenters and the other couples. 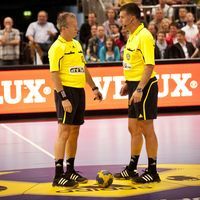 The referees will be evaluated and after the tournament, the lecturers will inform the candidates whether they are to be accepted as an EHF referee. For more information about the European Universities Games handball tournament, visit the official website.